Forward looking and over 130 years proud. Since construction drawings represent such a large portion of the construction documents necessary to build any structure, it is essential that all people involved in the building process- including office/field personnel, planners, suppliers, etc.- know how to interpret them. The ability to visualize the end product comes from the ability to comprehend the designer’s language. This is accomplished through the memorization of the technical vocabulary including common lines and symbols. Once a student is familiar with the designer’s goals and language, he/she will be able to increase their ability to visualize the end product through practice. 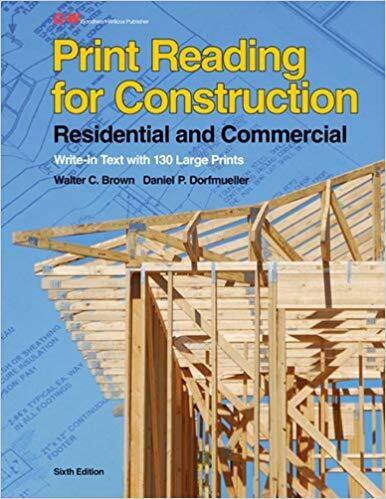 This class emphasizes the development of print reading skills in order to understand common and new construction techniques in building commercial projects. Time: 3:00 pm to 5:00 pm. Participants will need to Rent or Purchase the text book and bring it with them to the first class. Please make sure it includes the supplemental construction drawings. Brown, Walter C., & Dorfmueller, Daniel P. (2013) Print Reading for Construction: Residential and Commercial. 6th ed. Tinley Park, Illinois, The Goodheart Wilcox Company.